This article is about the global music retailer. For other uses, see HMV (disambiguation). On 15 January 2013, HMV Group plc entered administration. Deloitte were appointed to deal with the administration of the company. On 16 January 2013, HMV Ireland declared receivership, and all Irish stores were closed. A week later, on 22 January 2013, it was reported that Hilco UK would buy the debt of HMV, a step towards potentially taking control of the company. The sale of HMV's Hong Kong and Singapore business to private equity firm Aid Partners was completed on 28 February 2013. On 5 April 2013, HMV was bought out of administration by Hilco UK for an estimated £50 million to form the current company. HMV Group plc, which had been listed on the London Stock Exchange and was a constituent of the FTSE Fledgling Index, was liquidated in July 2014. HMV Canada is a former subsidiary which was sold to Hilco by the HMV Group in 2011. HMV Canada went into receivership in 2017 after being sued by Huk 10 Ltd., a shell company owned by Hilco. Sunrise Records announced that it had negotiated to purchase the leases for 70 of HMV's locations from landlords to convert them to Sunrise stores as well as plans to retain as many former HMV staff as possible. The antecedents of HMV began in the 1890s at the dawn of the disc gramophone. By 1902 it had become the beginnings of the Gramophone Company. In February 1907 they commenced the building of a new dedicated record factory at Hayes, Middlesex. Disc records were sold in music shops and independent retailers at this time. In 1921 the Gramophone Company opened the first dedicated HMV shop in Oxford Street, London, in a former men's clothing shop; the composer Edward Elgar participated in the opening ceremonies. In March 1931 the Gramophone Company merged with Columbia Graphophone Company to form Electric and Musical Industries Ltd (EMI). From the 1930s onwards, HMV manufactured radio and television sets and radiograms under the HMV and Marconiphone brand names in their factory in Hayes, Middlesex. In 1966 HMV began expanding its retail operations in London. Throughout the 1970s, the company continued to expand, doubling in size, and in six years became the country's leading specialist music retailers. It faced new competition, however, from Virgin Megastores, established in 1976, and Our Price, established in 1972. Subsequently, HMV overtook Our Price in popularity and threatened their existence, having established a chain of newer, larger stores. The company opened its flagship store at a new location on Oxford Street in 1986, announcing it was the largest record store in the world at the time, and the official opening was attended by Bob Geldof and Michael Hutchence. Growth continued for a third decade into the 1990s, with the company reaching over 320 stores including in 1990 their first store in the U.S. located at 86th and Lexington in New York City which was the largest music retailer in North America. HMV celebrated its 75-year anniversary in 1996. 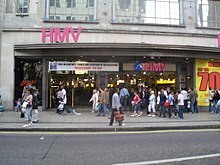 In February 1998, EMI entered into a joint venture with Advent International to form HMV Media Group led by Alan Giles, which acquired HMV's stores and Dillons, leaving EMI with a holding of around 45%. The new joint venture then bought the Waterstone's chain of bookshops to merge with Dillons. By 2002, EMI's holding in HMV Media was 43%, with Advent International owning 40% and management the remainder. The company floated on the London Stock Exchange later in the year as HMV Group plc, leaving EMI with only a token holding. The group became susceptible to a takeover following a poor period of trading up to Christmas 2005. Private equity firm Permira made a £762 million conditional bid for the group (based on 190p a share) on 7 February 2006, which was rejected by HMV as an insufficient valuation of the company. Permira made a second offer which increased the value, although HMV declined it on 13 March 2006, subsequently issuing a statement that the offer undervalued the medium and long term prospects for the company, resulting in Permira withdrawing from bidding. In 2006 the HMV Group purchased the Ottakar's book chain and merged it into Waterstone's. The merger tied into HMV's strategy for growth, as many of the Ottakar's branches were in smaller towns and outposts. The Competition Commission provisionally cleared HMV Group, through Waterstone's, for takeover of the Ottakar's group on 30 March 2006, stating that the takeover would "not result in a substantial lessening of competition". Waterstone's then announced that it had successfully negotiated a takeover of Ottakar's on 31 May 2006. All 130 Ottakar's stores were rebranded as Waterstone's prior to Christmas 2006. In March 2007, new Group CEO Simon Fox announced a 10% reduction over three years in the enlarged Waterstone's total store space, comprising mostly dual location shops created by the acquisition of Ottakar's. On 29 June 2007, the entertainment retailer Fopp went into administration, with the closure of 81 stores and 800 staff made redundant. On 31 July HMV bought the brand and six stores that it said had traded profitably, saving around 70 jobs. On 24 December 2008, Christmas Eve, HMV's rival Zavvi, also an entertainment retailer, entered administration. On 14 January 2009 a placing announcement by HMV revealed that they intended to acquire 14 of Zavvi's stores. On 18 February 2009 five additional Zavvi stores were purchased by HMV Group, to be rebranded as HMV outlets. An additional former Zavvi store in Exeter's Princesshay development was also added. The acquisitions were investigated and cleared by the Office of Fair Trading in April 2009. In the 2008 MCV Industry Excellence Awards, HMV was given the title 'Entertainment Retailer of the Year'. In January 2009, HMV bought a 50% stake in MAMA Group, forming a joint venture with the group called the Mean Fiddler Group. The deal introduced the HMV brand to live music venues, including the Hammersmith Apollo. On 23 December 2009, it bought the whole of the MAMA Group in a live music takeover deal worth £46 million. HMV bought 50% of 7digital for £7.7 million in September 2009, as part of a strategy to increase its digital content offering. 7digital provided HMV's music download service, and the company planned to introduce an e-books service for Waterstone's. On 5 January 2011 HMV announced that profits would be at the lower end of analysts' forecasts due to falling sales, resulting in the share price falling by 20% and an announcement of the group's intention to close 40 HMV stores, as well as 20 Waterstone's stores, mainly in towns and cities where the company operates at multiple locations. The first of the store closures began at the end of January 2011. The sale of Waterstone's to A&NN Capital Fund Management for £53 million was completed on 29 June 2011, and was approved by the vast majority of shareholders at an emergency general meeting. HMV sold the Hammersmith Apollo to AEG Live and Eventim in May 2012 for £32 million. It sold the remainder of MAMA Group to Lloyds Development Capital in December 2012 for £7.3 million, which also included the company's 50% stake in Mean Fiddler Group. On 15 January 2013, HMV Group appointed Deloitte as company administrators and suspended shares, putting its 4,350 UK employees at the risk of redundancy. Store gift vouchers were initially declared void since holders are classified as unsecured creditors to whom the company owe the value, but were accepted again from 22 January 2013. HMV Ireland followed by declaring receivership on 16 January 2013, which required the company under Irish law to close all its stores immediately. Restructuring firm Hilco UK bought HMV's debt from its creditors The Royal Bank of Scotland and Lloyds Banking Group, as a step towards potentially taking control of the company. It was revealed that the total debt Hilco had bought amounted to around £110 million, and that HMV owed around £20 million in tax to HM Revenue and Customs at the time of its entry into administration. On 31 January 2013, it was reported that 190 redundancies had been made at the head office and distribution centres. On 7 February 2013 Deloitte confirmed that 66 stores had been identified for closure. No fixed date was given for the closures but they were expected to take place in the following two months. The next day, Deloitte confirmed that an additional 60 redundancies, including the chief executive Trevor Moore, had been made at the group's head offices in London, Marlow and Solihull. Deloitte confirmed on 20 February 2013 that an additional 37 stores would close. On 26 February 2013, 6 stores were sold to supermarket chain Morrisons. On 28 February 2013, 8 stores in Hong Kong and Singapore were sold to AID Partners Capital Limited and the operation then became independent from HMV Group that bought by Hilco UK. This transaction also enables AID Partners Capital Limited to possess the rights to use the HMV brand in Hong Kong, Macau, China, Taiwan and Singapore. By 23 March 2013, Deloitte were seeking to complete a deal to sell 120 stores as a going concern. The decision to close several stores that had previously been identified for closure, including Stockport and Grimsby, were reversed following talks with landlords. By 21 March 2016, China 3D Digital Entertainment Limited acquired HMV Hong Kong operations from AID Partners Capital Limited, later renamed to HMV Digital China Group Limited. On 5 April 2013, Hilco UK announced that it had acquired HMV, taking the company out of administration and saving 141 of its stores and around 2,500 jobs. The total included 25 stores that had previously been selected for closure by Deloitte during the administration process. All 9 Fopp stores which HMV owned were also included in the purchase. Hilco also stated that it hoped to reopen an HMV store in Ireland following the closure of all stores in the country. The takeover deal was estimated at around £50 million. On 9 June 2013 it was confirmed that Hilco Capital Ireland had purchased HMV Ireland, and would reopen five stores within six weeks. The company moved its flagship Oxford Street store back to the original unit on 363 Oxford Street on 23 October 2013. HMV's existing store, itself the largest music store in the world, closed on 14 January 2014. By 2014, HMV had gained the second highest share of the UK entertainment market, behind Amazon. The company's filing to Companies House in September 2014 revealed it had made a profit of £17 million in the 11 months since it had entered administration. In January 2015, HMV overtook Amazon to become the largest retailer of physical music in the UK. However,the originally-safe stores of York,Soilhull,Portsmouth and Belfast would shut. The Belfast store shutting due to Mike Ashley being landlord. On 28 December 2018, HMV confirmed it had again been placed into administration. Hilco UK cited the "tsunami" of retail competition as the reason for the move. On 5 February 2019, Canadian record stores chain Sunrise Records announced its acquisition of HMV Retail Ltd. from Hilco UK for an undisclosed amount. Sunrise had previously acquired the leases for over 70 HMV locations in Canada after HMV Canada entered receivership, which expanded the Ontario-based retailer into a national chain. Sunrise plans to maintain the HMV chain and five Fopp stores, but immediately closed 27 locations, including the flagship Oxford Street branch and other locations with high rent costs. Company founder Doug Putman stated that he planned to increase the chain's emphasis on vinyl record sales as part of the turnaround plan: Sunrise's leverage of the vinyl revival had helped bolster the Canadian locations' performance after the transition from HMV, having sold at least 500,000 vinyl LPs in 2017 alone. Putman argued that, despite the growth of digital music sales and streaming, "talk about the demise of the physical business is sometimes a bit exaggerated, especially in music specialists. Most of the decline is coming from nontraditional sellers like the grocery chains. We'll be here for quite some time." Following the purchase by Hilco UK, it was reported that the company was seeking to reduce the number of store staff across the business, as part of an effort to save £7.8 million on the wages budget. Stores would lose security staff, cashiers and supervisors, with managers required to provide cover. As of August 2016, All HMV stores in Ireland had closed down and replaced with an online store. HMV Belfast re-opened up in March 2014 after over a £1 million pound refurbishment, making it the last remaining HMV store in Northern Ireland . HMV established a joint venture with Curzon Cinemas in October 2009 as part of chief executive Simon Fox's plan to bring cinemas to HMV and Waterstone's stores across England. The first trial cinema opened above the existing HMV store in Wimbledon, in a former storage room converted into three separate screens and a bar. It has its own entrance, allowing access outside store hours, and one within the store. The trial was deemed a success, and it had been planned to open additional cinemas in HMV's Cheltenham store, and Waterstone's in Piccadilly, London. In June 2015, HMV relaunched an online store to accompany its existing music download service. Independently of the UK operations, one store in Singapore and five in Hong Kong trade under the HMV brand, and are owned by the private equity firm AID Partners. HMV stores stock a range of products including audio, books, Blu-ray discs, CDs, DVDs, video games, as well as an increasing range of movie, television and music merchandise. The company launched a music download service in October 2013 (www.hmvdigital.com), provided by 7digital, which includes iOS and Android apps. The company relaunched its online store in June 2015, providing CDs, DVDs, Blu-ray Discs, and LP records for online order and home delivery via Royal Mail with exclusive stock also available. On 1 September 2008, HMV launched "Get Closer", a social networking site allowing users to import their own music library, rivalling other providers including online music stores Napster and the iTunes Store. The site was closed in September 2009. HMV operate a loyalty scheme branded as "pure HMV", first launched in August 2003, but subsequently closed and relaunched in 2008. The scheme awards cardholders points for purchases, which can be collected and redeemed on a number of rewards including vouchers to spend in-store, memorabilia and signed merchandise. ^ Brooks, David (15 January 2013). "HMV timeline from foundation to administration". Retail Week. Retrieved 22 March 2015. ^ "Contact us". HMV. Retrieved 22 March 2015. ^ "HMV buyer shifts focus to vinyl and backcatalogues". Retrieved 6 February 2019. ^ "Sunrise Records Chief Doug Putman Talks Rescuing UK's HMV Music Chain, Plans to Bring It Profitable". Retrieved 6 February 2019. ^ a b c "EMI: A Brief History". BBC News. 24 January 2000. Retrieved 15 January 2009. ^ "Waterstone's: a history". The Telegraph. London. 20 May 2011. Retrieved 26 January 2013. ^ "HMV snaps up Fopp name and stores". BBC News. 31 July 2007. Retrieved 15 January 2009. ^ a b "Deloitte appointed administrators to HMV Group plc, HMV Music Ltd, HMV UK Ltd and Fopp Entertainments Ltd". Deloitte UK. 15 January 2013. Archived from the original on 25 January 2013. ^ a b "HMV Ireland goes into receivership". The Belfast Telegraph. 16 January 2013. ^ "HMV: Restructuring specialist Hilco takes control of retailer". BBC News. 22 January 2013. ^ a b "HMV is sold to Hilco in rescue deal". BBC News. 5 April 2013. Retrieved 5 April 2013. ^ "HMV Group plc". Companies House. Retrieved 7 April 2017. ^ "Paul Patrick MCGOWAN - Personal Appointments (free information from Companies House)". beta.companieshouse.gov.uk. ^ "HMV in receivership, stores to close by Apr. 30 - The Star". thestar.com. Retrieved 13 February 2019. ^ "Inside the Oxford Street HMV Store in the Sixties – Voices of East Anglia". Voices of East Anglia. Retrieved 10 November 2015. ^ "1921: HMV's first store is opened by Edward Elgar". The Guardian. London. 15 January 2013. Retrieved 26 January 2013. ^ a b Philip Beeching (15 January 2013). "HMV: How the top dog lost its bite". BBC News. Retrieved 15 January 2013. ^ "Brit 'superstore' to set up shop in Gotham". Variety. 2 May 1990. p. 307. ^ Boehm, Erich (25 February 1998). "EMI spins off HMV record store chain". Variety. Retrieved 22 March 2015. ^ "WH Smith unloads book shop chain". BBC News. 25 February 1998. Retrieved 22 March 2015. ^ Bridge, Sarah (14 April 2002). "HMV sales boom prompts £1bn float". Mail on Sunday. Retrieved 22 March 2015. ^ "HMV set for stock market debut". BBC News. 11 April 2002. Retrieved 22 March 2015. ^ "Retailer HMV rejects bid approach". BBC News. 13 March 2006. Retrieved 15 January 2009. ^ "HMV rejects second bid approach". BBC News. 13 March 2006. Retrieved 30 December 2006. ^ "HMV suitor Permira abandons bid". BBC News. 20 March 2006. Retrieved 30 December 2006. ^ Muspratt, Caroline (12 May 2006). "HMV merger with Ottakers cleared". The Daily Telegraph. London. Retrieved 16 August 2009. ^ Walsh, Fiona (1 June 2006). "Ottaker's accepts HMV takeover though price is slashed". The Guardian. London. Retrieved 16 August 2009. ^ Feltham, Cliff (29 June 2007). "HMV to stay on High Street despite falling sales of CDs". The Independent. London. Retrieved 16 August 2009. ^ Allen, Katie (29 June 2007). "Fopp closes it stores and appoints administrators". The Guardian. Retrieved 23 March 2015. ^ "HMV snaps up Fopp name and stores". BBC News. 31 July 2007. Retrieved 31 July 2007. ^ "Placing announcement". HMV. 14 January 2009. Archived from the original on 4 June 2009. Retrieved 14 January 2009. ^ "End of the road for Zavvi". Manchester Evening News. 18 February 2009. Archived from the original on 7 September 2012. Retrieved 18 February 2009. ^ "HMV/Zavvi". Office of Fair Trading. 28 April 2009. Archived from the original on 3 September 2009. Retrieved 24 December 2009. ^ "MCV Awards '08". MCV. Retrieved 14 April 2008. ^ Wood, Zoe (14 January 2009). "HMV to enter live music market". The Guardian. Retrieved 22 March 2015. ^ Leroux, Marcus (15 January 2009). "HMV Group plugs into live music market". The Times. London. Retrieved 30 March 2010. ^ "HMV buys MAMA Group in live music takeover deal". BBC News. 23 December 2009. Retrieved 22 March 2015. ^ "HMV takes 50% stake in 7digital". BBC News. 3 September 2009. Retrieved 23 March 2015. ^ HMV warns on store closures. Financial Times. ^ Sweney, Mark (29 June 2011). "HMV Group completes sale of Waterstone's". Retail Gazette. Archived from the original on 25 September 2011. Retrieved 29 June 2011. ^ "Hammersmith Apollo in London sold by HMV to Stage C". BBC News. 31 May 2012. Retrieved 8 October 2012. ^ Anne-Sylvaine Chassany (3 December 2012). "HMV sells Mama Group music arm to LDC". Financial Times. Retrieved 22 January 2013. ^ "HMV music and film chain to appoint administrator". BBC News. 16 January 2013. Retrieved 16 January 2013. ^ King, Mark (15 January 2013). "Are your HMV gift vouchers worthless?". The Guardian. London. Retrieved 15 January 2013. ^ "HMV will accept gift vouchers". BBC News. 21 January 2013. Retrieved 21 January 2013. ^ Simon Neville (12 March 2013). "Asda holds talks over possible bid for HMV". The Guardian. London. Retrieved 16 March 2013. ^ Simon Bowers (15 March 2013). "Fopp suitors boost hopes of high street music stores revival". The Guardian. London. Retrieved 16 March 2013. ^ Alex Hawkes (2 March 2013). "HMV owed £109m to bankers and £20m to taxman at collapse, new figures show". This is Money. Retrieved 16 March 2013. ^ "BBC News HMV administrators announce 190 job losses". BBC News. 31 January 2013. Retrieved 1 February 2013. ^ "Deloitte press release – Together "HMV" or "the Companies" – in administration – update". 7 February 2013. Retrieved 7 February 2013. ^ "HMV boss Trevor Moore made redundant". BBC News. 8 February 2013. Retrieved 9 February 2013. ^ "HMV to close 37 more stores in UK". BBC News. 20 February 2013. Retrieved 21 February 2013. ^ Taylor, Gemma (26 February 2013). "Morrisons acquires 6 HMV stores". Retail Gazette. Retrieved 2 September 2013. ^ Graham Ruddick (23 March 2013). "Hilco in talks with suppliers about securing HMV deal". The Daily Telegraph. London. Retrieved 28 March 2013. ^ "Grimsby HMV store is saved from closure". Grimsby Telegraph. 27 March 2013. Archived from the original on 29 March 2013. Retrieved 28 March 2013. ^ James Ferguson (27 March 2013). "Stockport HMV given reprieve". Manchester Evening News. Retrieved 28 March 2013. ^ "Hilco completes acquisition of HMV" (Press release). Hilco UK. 5 April 2013. Archived from the original on 8 April 2013. Retrieved 5 April 2013. ^ Burke, Roisin (9 June 2013). "HMV stores set to re-open with €4m investment and 100 jobs". The Irish Independent. Retrieved 2 September 2013. ^ Howie, Michael (27 September 2013). "HMV to reopen legendary Oxford Street flagship store". London Evening Standard. Retrieved 23 March 2015. ^ Shaikh, Thair (14 January 2014). "HMV closes historic Oxford Street store". The Independent. Retrieved 23 March 2015. ^ Ruddick, Graham (4 August 2014). "HMV reclaims second place in entertainment market from Tesco". The Telegraph. Retrieved 22 March 2015. ^ Marlow, Ben (27 September 2014). "HMV stages £17m comeback". The Telegraph. Retrieved 22 March 2015. ^ Ruddick, Graham (16 January 2015). "HMV reclaims its position as Britain's biggest music retailer". The Telegraph. Retrieved 23 March 2015. ^ "HMV calls in administrators for second time in six years". BBC. Retrieved 28 December 2018. ^ a b Monaghan, Angela; Butler, Sarah (5 February 2019). "HMV reveals which 27 stores have closed after sale to Canadian music boss". The Guardian. ISSN 0261-3077. Retrieved 5 February 2019. ^ Evans, Pete. "Canada's Sunrise Records swoops in to buy British music store chain HMV out of bankruptcy". Retrieved 5 February 2019. ^ "Sunrise Records Goes National With HMV's Demise". FYI Music News. Retrieved 27 February 2017. ^ Hope, Fiona. "HMV brings back nine shuttered stores". PSNEurope. Retrieved 28 February 2019. ^ "Hmv Official Blog - Reopening Stores Article". ^ Ben Parfitt (15 April 2013). "Hilco to cut 400 jobs – report". MCV. Retrieved 17 April 2013. ^ Pakinkis, Tom (10 July 2016). "Remaining Irish HMV stores to shut within months as retailer takes on Netflix giant". Irish Independent. Retrieved 23 March 2015. ^ "HMV to open revamped Belfast store". www.newsletter.co.uk. Retrieved 6 October 2017. ^ Wood, Zoe (25 October 2009). "HMV cinemas: coming to a high street near you". The Guardian. London. Retrieved 15 January 2009. ^ Stassen, Murray (22 June 2015). "HMV relaunches web store". Music Week. Retrieved 5 July 2015. ^ "HMV administrators sell Asia shops". BBC News. 28 February 2013. Retrieved 26 February 2013. ^ "HMV". 7digital. Retrieved 23 March 2015. ^ Collins, Katie (17 October 2013). "HMV stages comeback with launch of digital download service and apps". Wired. Retrieved 23 March 2015. ^ Vizard, Sarah (18 June 2015). "HMV looks to bring high street experience online with new ecommerce site". Marketing Week. Retrieved 20 January 2019. ^ Hall, James (26 April 2008). "HMV tries to Get Closer with social networking test". The Daily Telegraph. London. Retrieved 15 January 2009. ^ Duncan Geere (7 September 2009). "HMV shutters GetCloser.com social network". Pocket-lint. Retrieved 2 November 2012. ^ "HMV Plans Reward Card Roll Out". HMV. 30 December 2008. Retrieved 15 January 2009. Wikimedia Commons has media related to HMV. This page was last edited on 5 April 2019, at 09:25 (UTC).